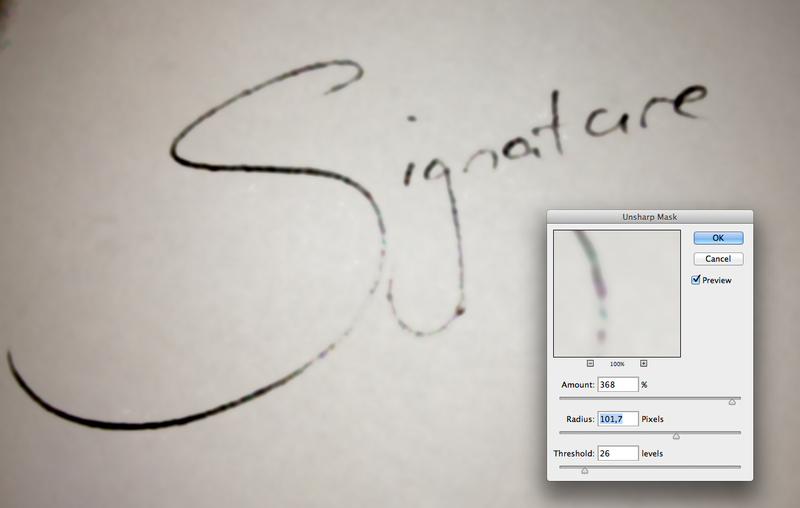 Step 1: Write the signature on a piece of paper and scan it or photograph it. For this exercise I used my iphone to photograph the ‘signature’ and emailed it to myself. Step 2: Open up the image in Photoshop or a similar bitmap editor like Pixelmator or Gimp and crop down to the actual writing itself. 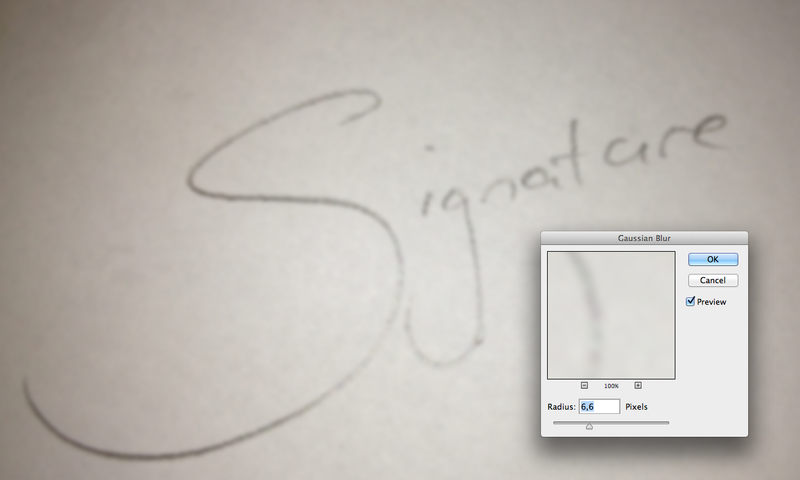 Then apply a Gaussian blur to the image (Filter>Blur>Gaussian Blur...). The idea is to smooth out the paper texture and begin to blend the ink or pencil marks from the writing. relatively smooth and white. This requires quite high amount and radius, and a touch of threshold to leave the white paper alone. Step 4: Next, apply a High Pass Filter to the image (Filter>Other>High Pass...). The higher the value the ‘thicker and inkier your signature will ultimately look. If you want thin and fine keep the numbers under 10. Thick and inky should be around 20 or so. 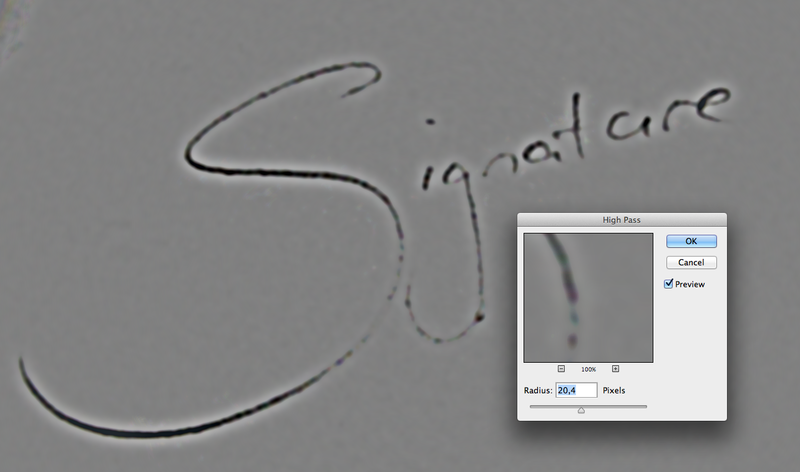 Step 5: To get the actual writing now go to Image>Adjustments>Threshold and play with the slider until only the signature remains (value 124 in this case). You can then simply erase the bits and pieces that you don’t want (like the spots that made it through the filtering process but aren’t part of the signature). Step 6: Now you can create a selection of your text by going to Select>Color Range and using the dropper to select just the black text. 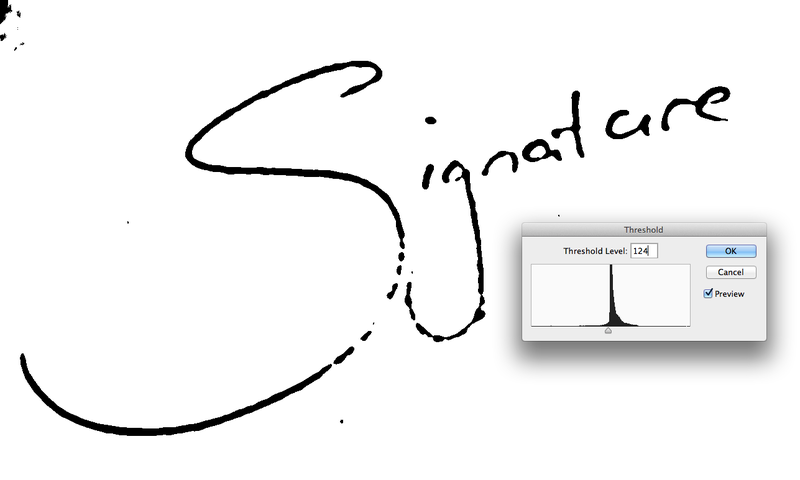 This will put marching ants around the signature after you press enter. Hit Command+J (Control+J for PC) and a new layer is created with the text inside it. Step 7: To get rid of the background and only have text simply delete your background layer. To make life easier in seeing your text you can create a new layer, drag it below the layer with your text and fill it with white ink (this is only for reference as this layer will be deleted before saving). 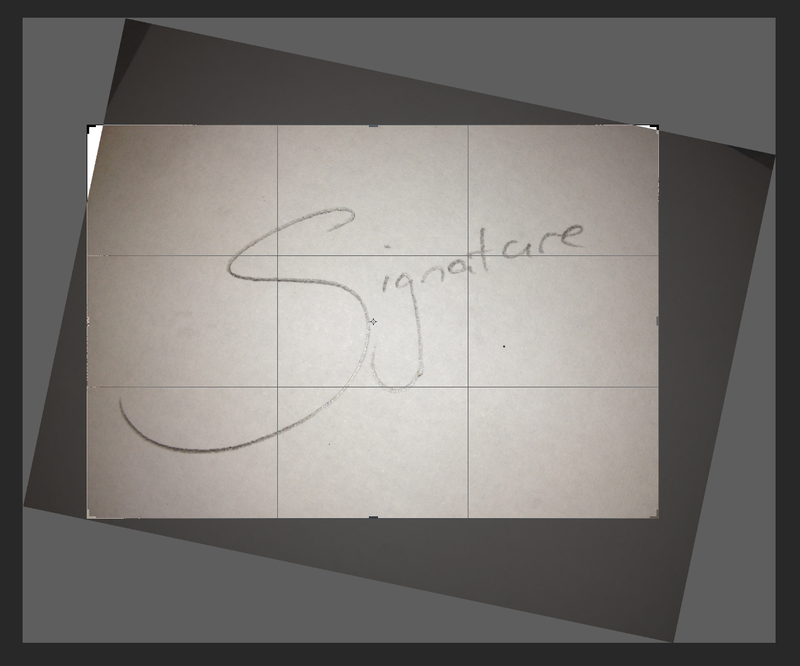 Step 8: To turn the signature into white text invert the image by simply hitting Command+I (Cntrl+I) while having the text layer highlighted (or go to Image>Adjustments>Invert...). 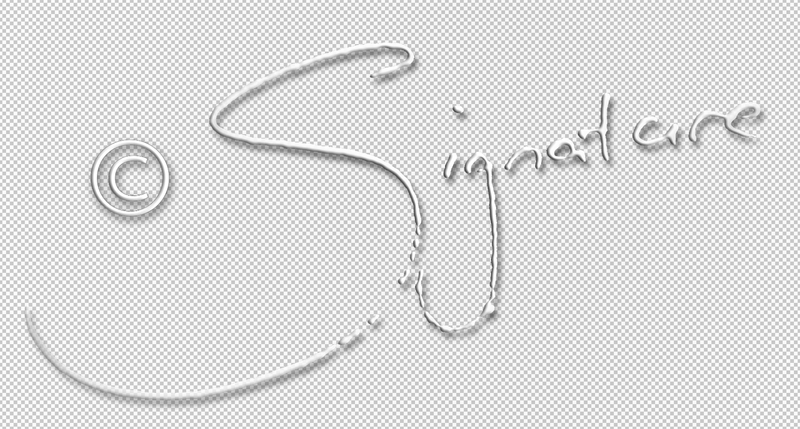 Step 9: To stylise the signature a little you can add layer effects by hitting the small FX button at the bottom of the layer palette or by going to Layer>Layer Style>Blending >Options... For the example I have used a bit of Bevel & Emboss as well as some Drop Shadow. Step 10: To add a copyright symbol select the Custom Shape Tool (shortcut key: U), choose white as your fill colour (use the tool settings at the top of the screen) choose the copyright symbol (right click the mouse while hovering over the image) and drag the cursor to create the symbol. As this symbol is on a new layer you can move it about to the right position. Step 11: Right click on the image layer and select ‘Copy Layer Style’. Select the layer with the copyright symbol, right-click and select ‘Paste Layer Style’. 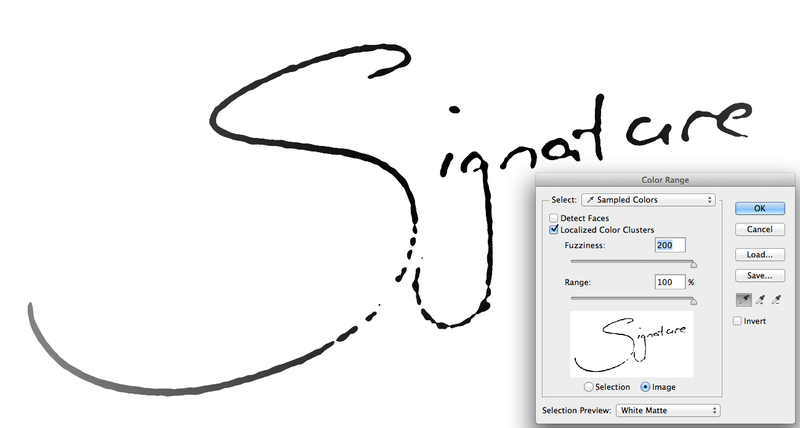 You now have both the signature and the symbol with the same style. Select these two layers (click on the layer and then while holding Cmd/Cntrl click on the other layer to select both at the same time. 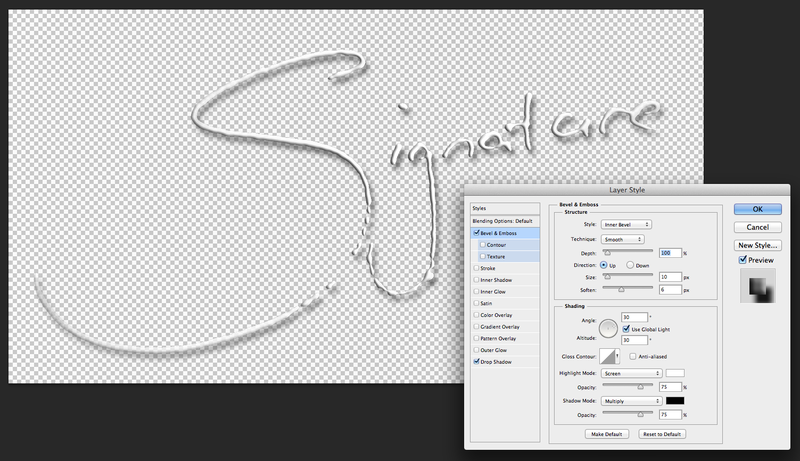 Step 12: Finally delete all the layers except that with your text and save the image as a PNG file (Shift+Cmd/Cntrl+S). A box pops up asking about compression and interlacing. Select no compression and None for interlacing. You now have a PNG file with a transparent background that you can copy and paste into any other image and resize to become a watermark. Make sure to save this file somewhere secure and you can also point the Lightroom watermarking feature to the file for automatic watermarking during export from LR (see this post). Photoshop tends to present one with a million ways to skin the proverbial cat. So there are other ways to do the same thing that I have just described. One technique for instance would be to create selections and masks based on the signature. This way you can change the colour more easily. Regardless of how you do it, if you want to return and tweak the watermark at any stage save a layered PSD or TIFF file (before doing step 12).